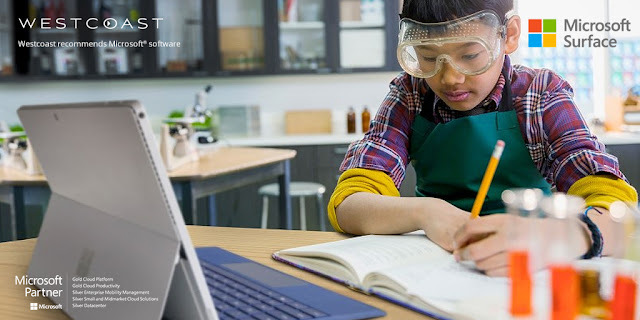 Education has always been at the heart of Microsoft, so it shouldn’t come as any surprise that in this age of apps, they now have a whole online store dedicated to educational tools, for both students and teachers – many free to use. So what, exactly, is on offer? The MS Education Store can be accessed by organisations or individuals, with offers for bulk – full class – purchases. We’d be here all day if we went through the full kit and caboodle, but here are a few of the key apps to suit your customers. · BrainPOP ESL – Sometimes the biggest challenge students face at school is learning English well enough to comprehend even the basics of every other subject. BrainPOP ESL has been devised to help make English language acquisition fun. It’s free to use and allows students to progress along their own learning curve at their own pace. Hear it First – It’s not just learners of English as a foreign language who need guidance when it comes to unfamiliar pronunciation. Whether studying French, German, Japanese, or any of 25 of the world’s most common languages, Hear it First allows users to type in words or phrases and hear the correctly accented word spoken back to them. GeoGebra – STEM subjects have been highlighted as a key focus for schools globally. GeoGebra is an industry-recognised, globally acclaimed mathematics suite created to aid in the teaching and learning of geometry, algebra, spreadsheets, graphing, statistics and calculus. Edmodo – One of the most incredible benefits of recent technological developments is the opportunities it delivers for long distance collaboration. Edmodo provides a secure shared work space, where students and teachers can virtually meet to discuss and collaborate on projects, opening the doors for interschool, or even international, collaboration. Adobe Photoshop Express – A free to use streamlined version of the world’s most popular photo editing suit, Photoshop Express delivers an intuitive range of tools ideal for preparing images for class presentations, or project augmentation. Blackboard – Dual purpose, Blackboard is both a virtual classroom for online learning, with real-time conferencing facilities, and a live noticeboard enabling students to stay up to date with events and timetables. Memorise It – This is an app the functionality of which goes far beyond the bounds of the class room. Whether cramming for an exam, preparing for a presentation, or trying to get your best man’s speech to stick, Memorise It uses your text to create anagrams, puzzles, visual clues and memory tags, all devised to make sure that the information is on the tip of your tongue whenever you need it. 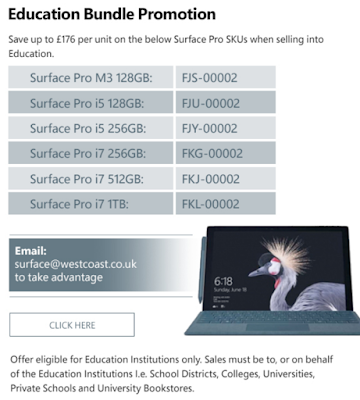 From pre-school games, such as Monkey Lunchbox (£1.24 to download), through Minecraft Education (£3.84 per user per year), up to the HP Prime Graphing Calculator App (£12.83) and the Microsoft Bing Chinese Dictionary (free), there’s something in the Microsoft education store for every user. They just need to know where to look to find it. Isn’t it time that you let your education customers know about what Microsoft could do for them? With the MS education store and the Surface of their choice at their fingertips, the world of learning could become their very own mollusc. 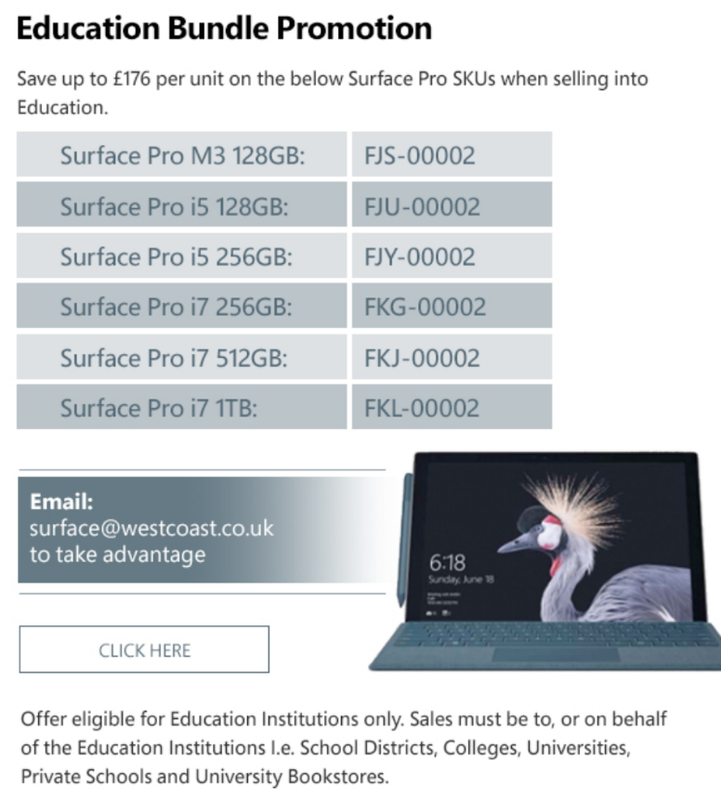 Contact your Westcoast Account Manager for more information on the Surface range and to find out about some great offers exclusively for Education … such as the below.